This 9 inch knife Sharpening Steel from J.A Henckels is a popular choice with home chefs and professionals alike. As you should all be aware by now, (and if not head to our knife sharpening ultimate guide), a sharpening (or honing) steel is designed for the everyday maintenance of your knives rather than to sharpen. In an ideal world you will use a sharpening steel on your knife every time you use it. There are countless steels available, so what makes the J.A Henckels worth checking out? Well the reliable German manufacturing for one. J.A Henckels are a respected brand for both their knife products and sharpening tools. (They do have a US branch as well, however the tools continue to be produced in Germany). So much faith has the company in its products, this particular sharpening steel has a lifetime guarantee. Beginning in 1885, the company has always striven to provide affordable well made steel products and that ethos has continued to present day. Very popular in Europe, the company branched stateside and has been providing kitchen tools for Americans for almost a century. 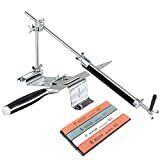 This 9 inch Poly knife sharpener, definitely fits into the affordability bracket, with the tool having a list price of $25 at the time of writing. 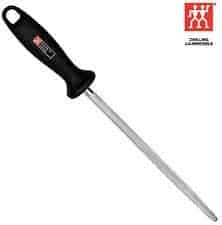 The tool is lightweight and very easy to use, with a flared handle and a tapered edge. Online reviews have commented on just how comfortable the sharpener is to use, with the balance being very good for experienced practitioners. 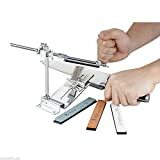 (Other reviews have stated that beginners may benefit with a honing steel of a more substantial weight – this is because a lightweight tool is more difficult to judge both angle and strike force against the blade). However for those that do opt for the J.A Henckels 9 inch, will be getting a high performing sharpening steel for their money. A highly recommended knife sharpening steel advised for those experienced with manual honing. However, beginners should not be put off. With a little practice you will be honing your knives before and after use with the confidence of a professional.